The two-day session was very interesting and the trainer made us feel very comfortable by making sure we understood the concepts of Scrum. I attended this training for CSM on 10-11 Feb 2018. The trainer (Steve Spearman) was excellent and was able to clarify all the queries. Agile Management ? Certified Scrum Developer Training In Hyderabad Hyderabad is a large metropolitan area and the capital of Telengana thriving with a significant percentage of skilled workforces. Home to more than 1300 global and Indian IT and ITES firms, this city has become the residential address of many professionals who have relocated here in pursuit of their career dreams. KnowledgeHut through its CSD Certification in Hyderabad offers a comprehensive CSD training in Hyderabad; all in an attempt to allow professionals hone their skills and settle in high-paying jobs. This course which puts across underlying principles in a clear and practical fashion comes as a star attraction for professionals aiming to stay abreast with the changes in time. What is the course all about? CSD course in Hyderabad discusses the fundamentals such as the Essence of Agile, Scrum basics and Sprints. The course also studies Scrum roles, ceremonies and Artifacts. The training scrutinises Test Driven Development (TDD), Acceptance Test Driven Development (ATDD) and Behaviour Driven Development (BDD). Identifying the differences between these approaches, the course highlights the scenarios in which the BDD fits into Agile. With BDD-based classroom exercises conducted, this course offers training on tools and languages like Gherkin, Fitnesse and Selenium. Certified Scrum Developer Training in Hyderabad provides an in-depth understanding of Agile Architecture and Design along with SOLID design principles, Design Patterns and Anti-Patterns. TDD, Unit Test Framework and refactoring of code are examined. Continuous Integration, build types and concepts of Continuous Testing, Inspection, Deployment and Feedback are a part of the curriculum. Benefits of the course: CSD Certification in Hyderabad offers a strong grasp of the Agile paradigm while preparing participants to write efficient and extensible code using best practices and standards; following the ideologies of Scrum in mind. The course also provides a 2-year membership with Scrum Alliance. 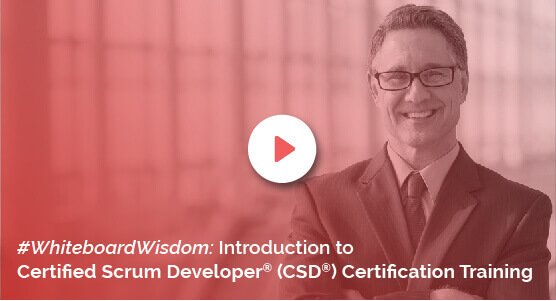 The KnowledgeHut Way: Certified Scrum Developer Certification is a comprehensive course conducted by a Scrum Alliance Certified trainer with a nominal cost which is inclusive of the exam fee.